Reception: Friday, July 14, 5-8 p.m. I hope these paintings speak for themselves, as a celebration of light and space, and of course dogs. 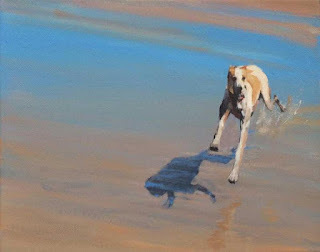 The "Dogs in Water" series grows concurrently with my series of horse-and-rider paintings. It explores many of the same issues of light and space, both as force and agency. But instead of the dramatic figures being massive creatures in the confined space of the arena, here the figures play on a lateral field with implications of infinity and interact in the entirely unique medium of water, itself both plane and figure. Included in the exhibit are selected paintings from the Arena series.